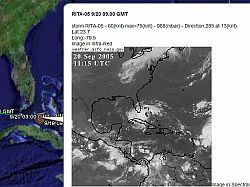 With the new Hurricane Phillipe in the Atlantic and Hurricane Rita threatening Florida and Cuba at the moment, this is a good time to introduce a new hurricane tracking link for Google Earth and a reminder of another one. First check out this new Hurricane tracker which not only shows the tracks of current storms for the Atlantic, but for the whole world. 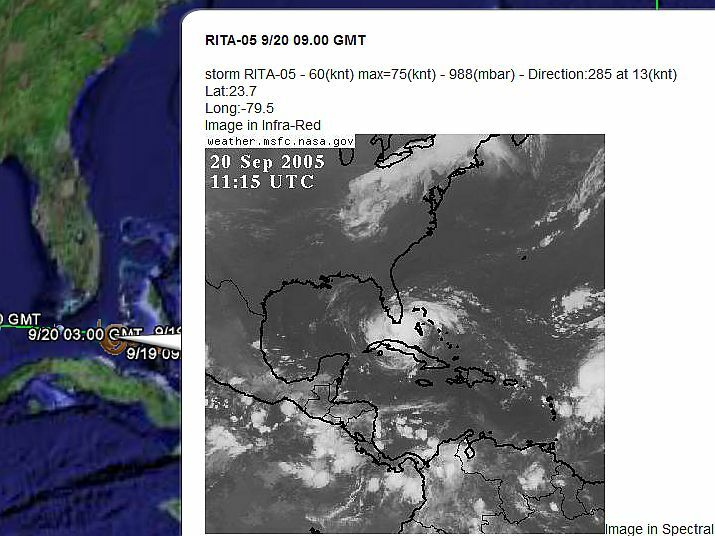 One of the new features is that the storm links themselves include a list of satellite photos which appear when you click on them as shown in the picture shown here. This new tracker was done by someone known as 'glooton' from 'La Faute sur Mer (France)' in the Google Earth Community and was released in this post. It is a network link, so any updates he makes should be automatic. Save it in your 'My Places' folder. Nice job glooten! You should also check out this other nice resource for following Atlantic tropical storms which I wrote about earlier. You also might want to read "All Atlantic Hurricanes 1851-Present". Yes, quite cool. I'm hoping someone will expand the amount of models they're tracking though. If you're looking for more Hurricane tracks, check out my article under the weather category called "All Atlantic Hurricanes 1851-Present". Do you mean the computer models? The second tool I mentioned in the article shows several computer models for possible directions a storm can take. As of 4 pm, Rita is a category 5 storm with 165-mph winds, located 300 miles west of Key West, Florida. Rita is moving west at 12 mph, and will move out into the central Gulf over the next 24-48 hours. Yet another one for the record books. This is the first time in recorded history that two Cat 5 Hurricanes have developed in the Gulf of Mexico in the same year. Thanks for the update Jeff, you have a nice web site for storm/weather related news.